Anyone who suffers from Plantar Fasciitis knows how painful it can be. But, thankfully, there are lots of arch support sneakers that can help. 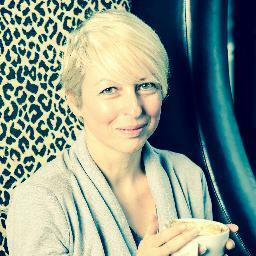 It’s a condition which can affect every aspect of life, making walking or running painful. But, not only are there lots more shoes available these days which provide foot arch support, they are also hipper than they have ever been. Sneakers are very on-trend this season and can be a great option if you suffer from Plantar Fasciitis. (if not you may enjoy our roundup of fashion sneakers.) 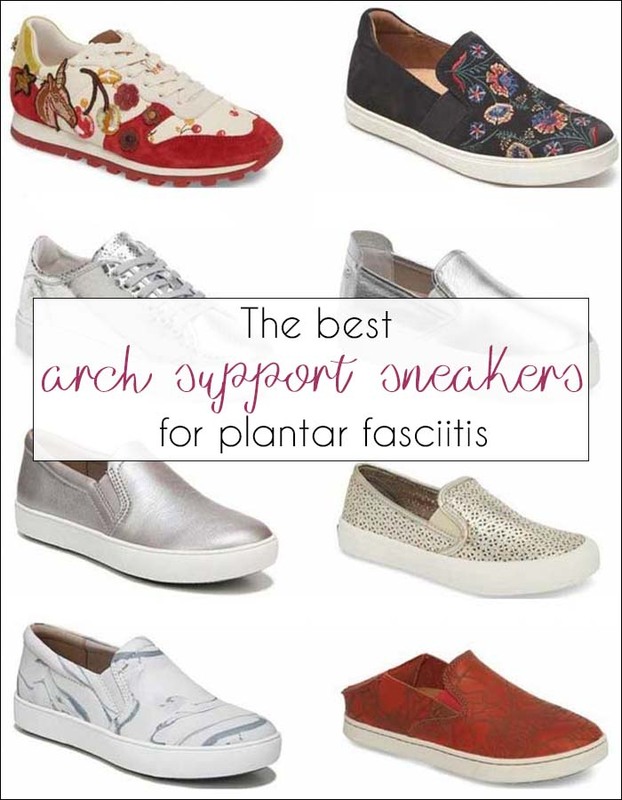 If you want to explore other options for shoes for plantar fasciitis, there are also lots more ideas in this piece on the best plantar fasciitis shoes for women over 40. While everyone’s feet are different and finding the perfect pair of plantar fasciitis shoes can be a question of trial and error, there are some general tips from foot experts on finding a pair of sneakers. One of the best tips is to wear arch support shoes all of the time. Whether you’re doing the shopping, exercising, going to work or heading out to dinner, choose shoes which have good arch support. Your shoes need to distribute your weight over your whole foot, not just your heel. Think about cushioned insoles. If you need to modify the sneakers you already have in your wardrobe, buying cushioned insoles can provide extra support. Because Plantar Fasciitis causes shooting pain in the heel, it’s vital to choose a pair of sneakers which offer good heel support. The heels should act as shock absorbers to prevent more damage to your foot. Look for good grip on the soles of your sneakers. Any trips or falls could do extra damage to your heels, making the condition even worse. Don’t think you have to compromise on style when it comes to plantar fasciitis shoes. There are more brands and styles than ever before in stores, most of which look no different to ‘normal’ footwear! 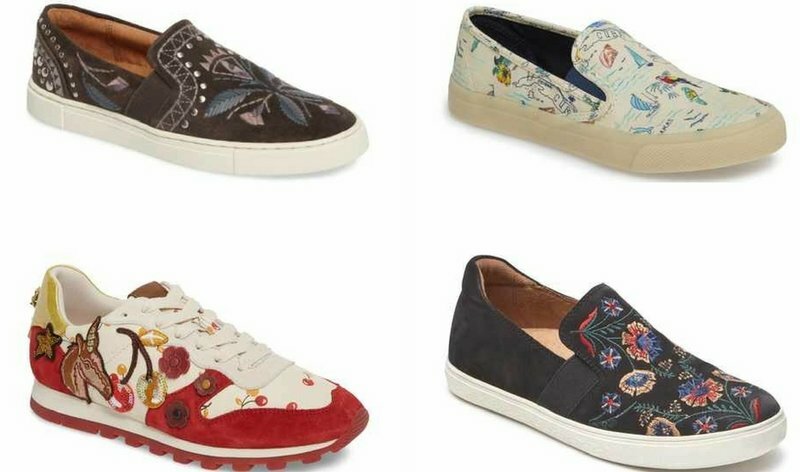 Slip-on sneakers are great for adding a casual vibe whether at home or on vacation, but where you don’t want to wear sneakers which look too sporty. Many arch support shoe brands have embraced the trend for silver shoes. These are an instant way to update your wardrobe and support your feet at the same time. A definite win-win! Just because your feet need a little extra support, that doesn’t mean they should have to forgo fashion! 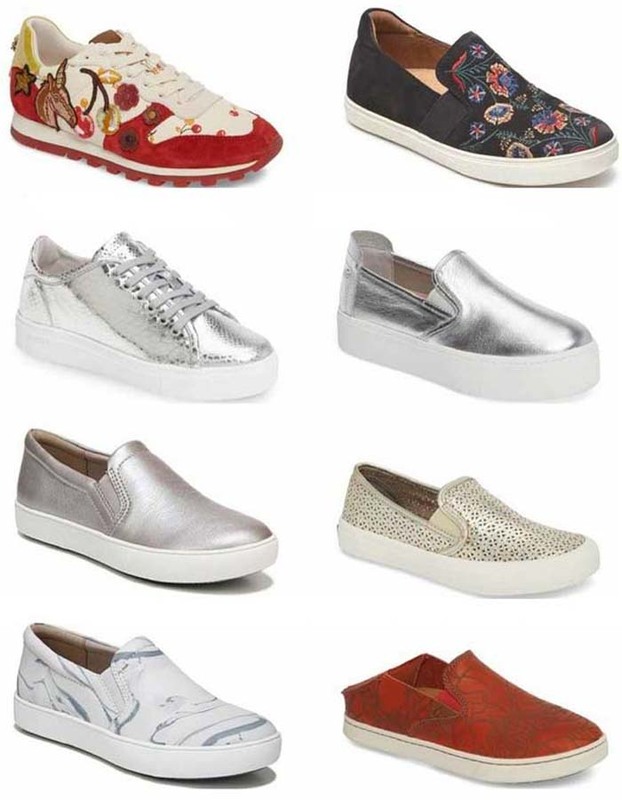 Embellished sneakers were a huge trend on the runways for spring and summer. And, luckily, the brands which make arch support shoes have embraced the trend for more-is-more! These Coach sneakers have taken a Gucci-esque approach to embellishment with patchwork, while the Sperry sneakers have a slightly Saint Laurent vibe. But, while Saint Laurent sneakers feature palm trees, these have gone for a map! You might also want to take a look at this piece on sneaker trends for some further inspiration! If you’re a keen hiker, do a lot of walking, or walk around the course while playing golf, then you’ll want to choose a pair of sneakers which offer high levels of support for your activities. Choosing sports shoes which add a pop of color can add some fun to your exercise outfit. There is a big choice of brands which make foot arch support shoes and many of you have already told us about your favorites. Based on experience, and lots of useful comments from you, some brands you might want to try are Ecco, Fly London, Naot Footwear, Earthies and Keen. 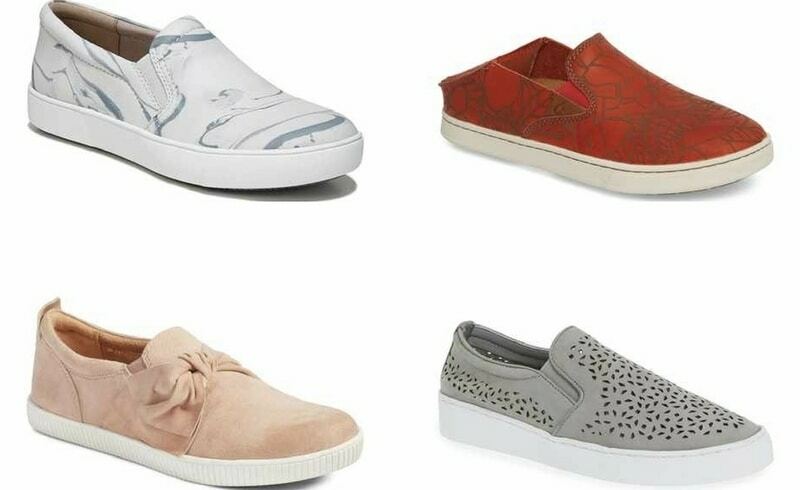 Naturalizer also has many sneakers which are on-trend this season, as does Geox and Frye. There are more suggestions in this extensive guide to arch support shoes. If you have shoes you love but have relegated them to the back of your wardrobe because they are no longer comfortable, then you might want to think about buying insoles or inserts for plantar fasciitis. 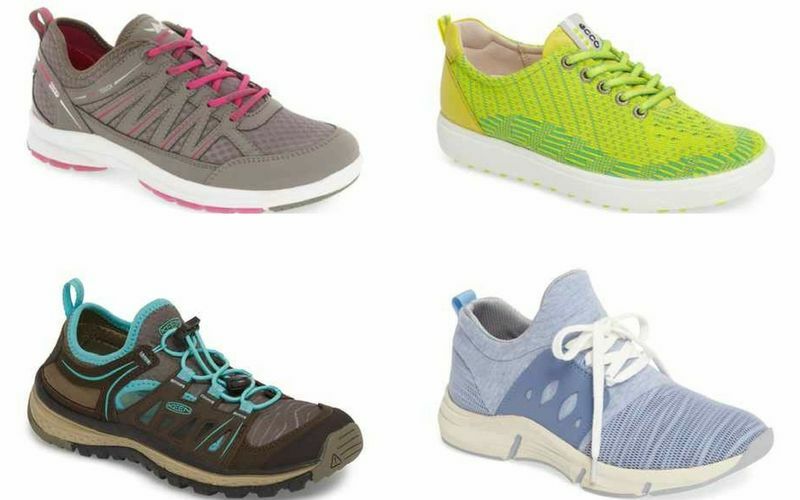 There are lots of brand ideas in our guide of shoes for plantar fasciitis. Have you found the perfect plantar fasciitis sneakers? Let me know which brand of arch support sneakers you wear! Perhaps a bit off subject, but I want to share it. I have inflammation in my left knee. And found out it is caused by wearing the wrong support soles. Perhaps they were wrong from the start 10 years ago or perhaps they got wrong over the years. I never had them checked. But apparently your body can change. Just a little warning for everybody wearing support soles, have them checked every year to see wether they still are right for you. I was nearly operated on that knee. The orthopedist never thought of this possibility.